Colourful turbans adorned by moustached men wearing earrings. Women peeping out of the windows of intricate havelis, clad in Bandhej sarees, faces covered. I have often been asked if I stay in Rajasthan as my Instagram feed has ample of Rajasthan pictures. The state has never disappointed me, and every visit has enriched my travel quotient with so many new stories. A lot of people ask me why this state is so close to my heart. So here’s a list of reasons why urge every traveller to experience this state. If these reasons don’t tempt you to pack your bags and lose yourself in the grandeur of Rajasthan, I wonder what will. Palatial havelis of Jaisalmer , magnificent palaces of Jaipur, outstanding forts of Jodhpur and the wonders of Bikaner – the architecture of Rajasthan will leave you spellbound. Travel back in time when you visit the Havelis of Shekhawati : abandoned yet so regal! Walk through the symmetrical corridors of Mehrangad in Jodhpur, explore the magnificent Amer fort, capture the captivating red at the City Palace in Jaipur, and marvel at the intricate details in the jharokas of the Patwo ki Haveli in Jaisalmer. Rajasthan is also home to the breath taking Jain temples of Ranakpur, which are a visual treat. For those who love unseen places, Deeg Palace, Bhangarh fort, and sthe lesser known city of Alwar are great options. Traditional bazaars of Rajasthan offer a plethora of shopping options which can drive shopaholics insane. Not only are these bazaars full of colour but they also bring out the essence of these old cities. Jodhpur: Lakhera bazaar: Lac bangles, Tripolia bazaar : Apparel, bedsheets, rugs. Jaipur: Bapu Bazaar: Bangles, Shoes, Apparel, handicrafts. Do not miss the blue pottery of Jaipur, carpets of Ranakpur, and handmade paper products of Sanganer. Load your shopping bags with Bandhni, Bandhej, Gota work apparels, traditional Jaipuri bedcovers, lac bangles, Rajasthani mojris and more. Imagine sleeping in a tent right under the stars, in the middle of the Great Indian Thar desert. With glorious views of the sunset and sunrise, the dunes offer nothing short of sheer magic. The whole experience is enriched further with Rajasthani folk music and dance, giving an earthy, rustic feel to the desert ambience. Wildlife lovers can explore the flora and fauna of this place in a safari. If you are an avid road tripper, you wouldn’t want to miss a drive on the highways of this state. Impeccable, well maintained roads with a glorious landscape can be a treat to any weary eyed traveller. 5.Float on The Venice of the East. Move over Gondolas! Float over the Pichola Lake and steer past houses in water. Marvel the architecture of Jag Mahal, situated right in the middle of Lake Pichola. Udaipur is a quaint city flaunting lakes like Pichola, Fatehsagar, palaces like City Palace, a beautiful, ancient Jagdish temple and the royal gardens of the Queens: Saheliyon Ki Badi. Dine at The Upre restaurant for glorious views of Lake Pichola. The Jungles of Ranthambore hold many secrets- from the thrill of sighting an orange to finding a black coat is one of them. Rugged landscapes, barren trees, and a wide variety of birds are some of the reasons why Ranthambore should be on every wildlife lover’s bucket list. With over seven zones, the chances of spotting a tiger are relatively high. The forest visit is more than gratifying. Apart from spotting a tiger, the park gives abode to a variety of deer, birds, and reptiles, including the gharials. 7. Say Ganni Khama to the warm people and be bold over their hospitality! Simple people, honest smiles, and lots and lots of warmth. Be prepared to be pampered and bowled over by Rajasthani hospitality as you fall in love with their humility and willingness to help. The recent, super creative advertisements of Rajasthan tourism capture the essence of the alluring culture of this state. From piping hot Gatte ki sabzi to the delectable Daal Baati Choorma and Ker Sangri of the desert. From mouth-watering Mirchi Badas of Jodhpur to the Pyaz ki Kachoris of Jaipur; Rajasthani food is a delight to the taste buds. Mirchi Badas: Janta sweets, Jodhpur. See the grandeur of the camel fair at Pushkar in November and witness the surreal “Deep Daan” at the Pushkar lake. In the month of Kartik, on a full moon day, thousands of glittering lamps are lit and floated in the lake. Even if you cannot visit Pushkar during the fair, there is always the Brahma temple, India’s only Brahma temple which can be visited. The Keoladev Bird Sanctuary is the only park where you can walk through, hire a cycle or birdwatch sitting in an auto rickshaw. The place is home to a variety of resident birds as well. Best time to visit is from November to January. Walking through this park is an absolute awe-inspiring experience for all nature lovers due to its surreal walkways and beautiful landscapes. The state has something for everyone. There is no dearth of things to do in Rajasthan. What are you waiting for. Plan a Rajasthan trip and soak yourself in the charm of this state. Be it adventure, wildlife or birding, cultural tours, exploring heritage, photographing architecture, many a sumptuous food trail. No matter how many times I visit it, there is always an inexplicable urge to visit it again. The tunes of Padharo Mhare Des have certainly reached your ears. So what is your reason to visit this magical state? Such lovely captures Divyakshi!! Rajasthan is one of those places which no matter how many times you visit there’s something new in store for you. Your post is a feat to the eyes, and your reasons all top notch 😀 But I got sold on the pictures straight away! Hehe 🙂 thanks a lot! Thanks a lot Archie 🙂 the Tiger is an absolute must see. Ranthambore had some great sightings! Very good reasons. My top reasons to visit Rajasthan is food and desert. 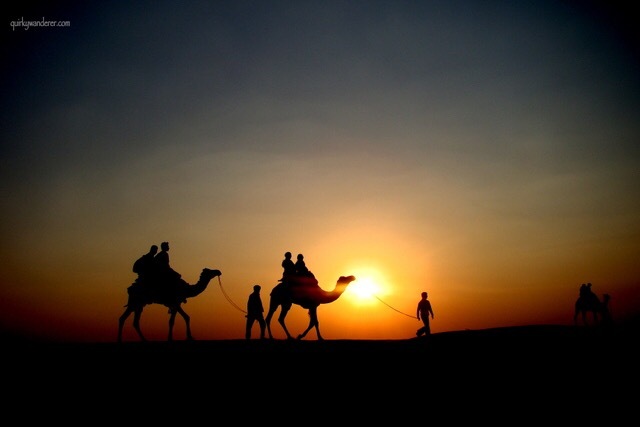 This does make me want to pack up and visit Rajasthan… imagine a desert…. being this colourful 🙂 lovely post Divsi…. Yay! 🙂 thanks so much Anky! Brilliant beautiful, lovely, fantastic wah, wah! This was such a treat, feast for the eyes Divsi! I have been to the 3 J’s of Rajasthan and absolutely loved the trip. But your lens as usual have captured the beauty of the place so much more vibrantly! Every reason to go revisit this lovely place! Thanks so much Kala for being ever so encouraging 💕 😊 we will go together sometime. A textile trip! this is the Beauty of Rajasthan..
That is so exciting! 🙂 I still haven’t been to ladakh! I read your posts on Udaipur 🙂 Loved them! I belongs to Rajasthan. Yet I have not visited many of the places you mentioned above. Except pushkar which is my hometown. Beautiful pics :). You have amazingly captured the heart and soul of Rajasthan :D.
Thanks much Aseem 🙂 Glad you liked it! Love this! It makes me want to return to India. I agree thoroughly..I haven’t visited all Rajahstan though – only Jaipur and Udaipur (still think they are awesome!). I am proud to be an indian!! Great Article, the feel of Rajasthan is non forgettable. The colorful attire and the famous traditional song Kesaria balm… padharo mare desh made me crazy. Every year, I think, this year, I’ll make the Rajasthan trip. But, couldn’t make it till as it needs a long vacation. But, your post is so amazing that I couldn’t resist myself to explore this beautiful place as early as possible. Pictures are very nice, especially, the portraits. Perfectly described. There is no ‘last trip’ to Rajasthan. These photographs speak a lot..